As part of the "Fall for the Arts" festival the Sandwich Arts Alliance is hosting the 'Arts in Action' indoor show and silent auction, as well as the inaugural 'Porchfest' event throughout town. More details below. 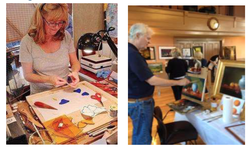 ARTS IN ACTION - Saturday, October 8, 2016 10 - 3 p.m.
We greatly appreciate the kind generosity of our artists for donating their masterpieces as the proceeds will help the Sandwich Arts Alliance continue their mission.